Golden Rule of One-Pass Seeding - the goal is to apply all of the seed and fertilizer requirements in a single operation without the seeding operation itself incurring risk to the potential crop. Mid Row Banders minimize the risk of fertilizer damage to your seed by placing the crop’s nitrogen fertilizer requirements between every other seed row eliminating the risk of fertilizer toxicity and salt effect, and eliminate seedbed quality issues such as soil lumping and excessive soil disturbance resulting in premature seedbed dry-down. The Bourgault Series 25 MRB® II fertilizer application system is designed and built with the same commitment to ingenuity, simplicity, and durability that is found with every other Bourgault product. 10" (254mm) and 12" (305mm) spaced 3310 PHDs™ (Series 25 MRBh). Quick Height Adjust - Quickly adjust the operating depth of the MRBs®. 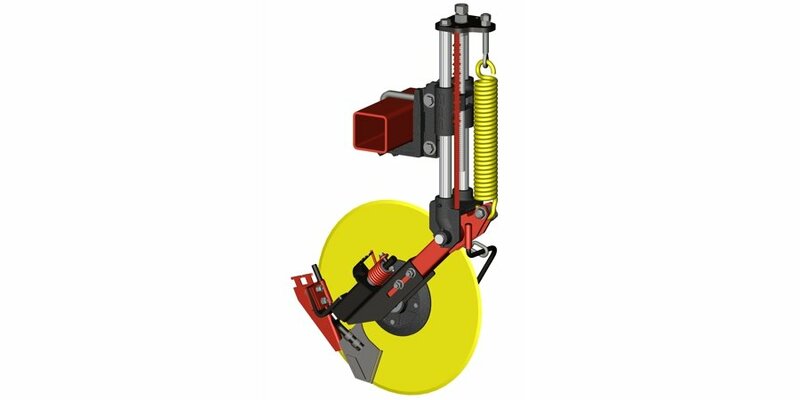 Coulter Opener - The large 20” (508mm) long-wear coulter opens the fertilizer furrow and cuts field residue. Scraper Position Adjust - The user friendly slide adjust scraper/boot system allows for adjustment as the disc wears. Service Free Coulter Pivot - The heavy duty coulter arm features a chrome pin with a 4” (102mm) wide pivot for a large bearing area. Trip Force - The initial trip force is set at 450 lbs (204 kg) of force. Durable Design - The pivot stop and spring connection to the arm is designed for low wear and long service. Fertilizer Combo-Boot - The Combo-Boot allows the producer to apply dry urea, liquid UAN, or anhydrous ammonia. Trouble-Free Depth Adjustment - Durable, grease-less bushings located in the cast height adjustment mount provide a solid low friction fit on the carbo-nitrided shafts. Agricultural Class Hub - An agriculture-grade cast hub with heavy duty seals ensure long operation with minimal service. Adjustable Scraper Pressure - Carbide floating scraper protects the combo-boot and maintains a clean furrow. Outside Closer Tine - Helps seal the furrow and cleans the outside of the coulter. Optional Closer Wheel - For 5725 Air Coulter Drills, an optional closer wheel is available in place of the closer tine for more aggressive furrow closure. Series 20 Mid Row Banders® are available on special order for mid row fertilizer application on Model 8800 & 8 inch spaced 8810 seeding systems.